Bruce played the song 39 times in full, previously it had only been used as part of other songs. The end of "The E Street Shuffle" includes a line from "Pretty Flamingo", which will debut the following week in Houston. Earliest known complete "Pretty Flamingo". A sellout and a very rare treat for the lucky 1,800 attendees. 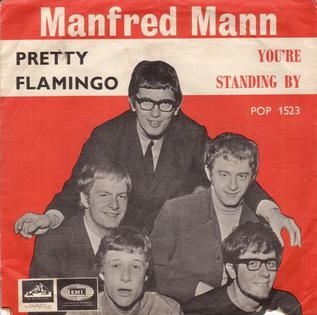 Manfred Mann's "Pretty Flamingo". Held in the school’s Hill Auditorium. Bruce’s 26th birthday and he delivers an extra special performance, among the best on the Born To Run Tour. The 'bomb scare show'. Just 45 minutes into the concert a bomb threat is phoned in to the theatre, and the night's MC Bob Reitman (disc jockey for WQFM) is forced to enter the stage after "Thunder Road" (which is the slow version featuring Roy on piano and Bruce on harmonica and vocals) to inform the crowd of the threat, asking them to return in three hours time. The police search the theatre and find no bomb, so the band return at midnight for another two hours on stage. Bruce and the boys passed the time during the delay in a nearby bar (according to Bruce, the Pfister Hotel in downtown Milwaukee) and as the show gets back underway it's evident that Bruce has had a few drinks - repeatedly and hilariously asking the audience "are you loose?!" This was the opening of a four-night (six-show) residency at the club. Songwriter Carole King was present at this show and Springsteen premiered and dedicated a heartfelt rendition of her 1966 song "Goin' Back" to her. Other luminaries present include Jack Nicholson, Peter Boyle, Robert de Niro, Jackson Browne, Jim Messina and Neil Diamond. It may have been at this show that de Niro heard Springsteen's "you talkin' to me?" schtick that he later famously improvised in Taxi Driver. Held in the school's Gammage Auditorium. One of the more memorable - and best - shows of the Born To Run Tour. There were phoned-in bomb threats received several hours before the start of this show - however, after some initial panic by organizers and the Springsteen camp, the police determined that the individuals making the threats had gotten their schedules mixed up - they'd been intended for controversial ex-Vietnam veteran Lieutenant William Calley's speaking engagement in Gammage the previous night! Springsteen delivered a blistering show and worked the crowd into a complete frenzy, so much so that the large, humanity-packed balcony of Gammage began visibly swaying during the final stages of the concert. It was later reported that school officials had nearly decided to stop the show prematurely, although a post-concert engineering report gave the balcony a clean bill of health. Bruce refers to this incident when he returns to the same venue in 1996: "It's nice to be back at the Gammage… I seem to remember wrecking this place as a young man… yeah, something about the balcony, I don´t know… I´m sure they got it all fixed by now, fortunately…" He went on to suggest that those seated on the balcony refrain from too much dancing. " Pretty Flamingo replacing "The E Street Shuffle" . Despite newspaper reports to the contrary, the show does not feature a unique performance of "Here Comes Santa Claus", a cover of the early 60s Bob B. Soxx & The Blue Jeans / Phil Spector-produced hit; instead the tape confirms the expected performance of "Santa Claus Is Comin' To Town." This song was immediately followed by Santa making a surprise appearance onstage, clowning around with Bruce, and handing out toy instruments as gifts to the band. "Rosalita (Come Out Tonight)", which includes a snippet of "Theme From Shaft" in the midsection. the set includes the first known "Pretty Flamingo" of 1976. A special concert played at the request of John Hammond, who was close friends with the family of a Rosemary Hall resident. As a result Springsteen performed for a substantially lower fee than usual. Excellent set features Eddie Floyd guesting on "Raise Your Hand" and "Knock On Wood" (which includes the only known Springsteen rendition of "Yum Yum Yum (I Want Some)"). "Spirit In The Night" includes a line from "Stagger Lee" in the introduction. "Rosalita (Come Out Tonight)" includes "Theme From Shaft" in the midsection. It's after this particular show that Springsteen and Van Zandt take a cab out to Graceland, and Bruce jumps the gate in an attempt to meet Elvis, who is actually in Lake Tahoe. Bruce is escorted off the grounds by security. "Rosalita (Come Out Tonight)" includes Roy playing about a minute of Bach's "Prelude No. 1 in C Major (BWV 846)" and a snippet of "Theme From Shaft" in the midsection. Also a very rare performance of the Gary U.S. Bonds early 60’s classic “New Orleans” (incorrectly listed as “Mississippi Queen” by many sources). "Rosalita (Come Out Tonight)" includes Roy playing a bit of Bach's "Prelude No. 1 in C Major (BWV 846)" and a snippet of "Theme From Shaft" in the midsection. Famous concert when Bruce returned to the stage after the house lights went on to perform the last two numbers to a stunned remaining few. The excellent show includes the first version of "Pretty Flamingo" since the '75 tour. last known "Pretty Flamingo" (until 2003). This is the famous "Firecracker show" where someone threw one on stage which hit Bruce, provoking a rant from Steven Van Zandt. Bruce sings a line of "Pretty Flamingo" during "Backstreets". "Backstreets" has some lines from "Pretty Flamingo" in the 'Sad Eyes' section. Bruce sings a line of "Pretty Flamingo" during "Backstreets"
Pretty Flamingo is played for the first time since 1978, without any story about long legged girls walking past on the street. "Pretty Flamingo" was a sign request. 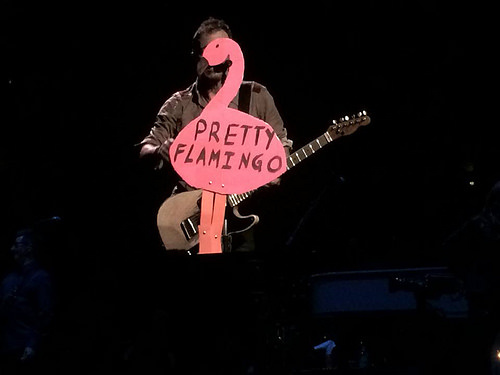 tour premiere of "Pretty Flamingo", via a pink flamingo-shaped sign request. Bruce adds a line from "Pretty Flamingo" to the "Here She Comes Walkin'" introduction to "I Wanna Marry You", which also includes a bit of "Chapel Of Love" at the end. Bruce adds a line from "Pretty Flamingo" to the "Here She Comes Walkin'" introduction to "I Wanna Marry You". Bruce and Clarence join Beaver Brown. Apparently, the whole band were at the club but they didn't all play. "Pretty Flamingo" is a song written by Mark Barkan, which became a hit in 1966 when Manfred Mann's recording of it was released as a single. The speaker describes a woman—whom "all of the guys call [...] 'Flamingo', 'cause her hair glows like the sun and her eyes can light the sky"—for whom the singer has fallen, and his plans to win her affection. The recording features future Cream bassist Jack Bruce, who briefly joined the band in 1965. The original demo of the song was recorded by noted New York City vocalist Jimmy Radcliffe stylized for The Drifters, but songwriter Mark Barkan was dissatisfied with the overly produced results and had Radcliffe recut the song with a pared-down arrangement. "it was like, it was the New Year’s night, just like tonight except it was about...except it was about...about four years ago, you know, four or five years ago...and...it was late, it was about, it was about ten o’clock, you know, and uh...had the gas-station next door to my house was open all night, there was, there was people hanging out in there all the time...me and Steve, there was this big, all my life, I spent 18 years of my life with this big Sinclair sign right, right, blaring in my front window, you know, and there’s like, there’s like...me and Steve were sitting out there that night on my porch, you know...and we was trying to figure out what we were gonna do...nobody invited us to any parties, if we were gonna get dressed up, you know, if we, if we were gonna get fancy and go to a club or something and, uh, we couldn’t decide and all of a sudden across the street, came walking down the street, came, like, this girl, she had feathers all in her hair, she was dressed all, she was dressed in red and she was like just, you know, was out of sight ... I said “Steven, look at that girl,” he said (Steve: “I’m looking, Boss”) he said he was looking and we sat there...I said “Steven...that’s a nice classy looking girl, right?...a classy looking girl, must be going to a classy looking party in a classy house and being that we are classy guys we (crowd cheers) we should follow, you know” so we did, right, we fell in love with this girl we didn’t know and we followed her, we followed her down the street...we watched, we walked about ten blocks...pulled down this fancy street in town and she walked into this house, you know, and the guys opened the doors and you could see the fellas with the tuxedos on, right, and she walked in, we stood out there, it was about ten degrees, you know...and we’re trying to see in the window, you know...so, uh...we’re standing there, it’s cold, we’re waiting for her to come out or something…so I said “Steve, listen...won’t you go up on the porch...knock on the door, right, tell ‘em that, like, that like, like you’re the Mayor’s son or something, right” (chuckles) see, that was, that was, that was cool to him so, so he went up on the porch, knocked on the door, somebody pulled up the shade...then put the shade back down...so I snuck over, peeked in the window, right, and there she was sitting on the couch with this slick looking guy, you know, and they was all crowding around, it was about, about quarter to twelve, and we stood out there, I said “Steve, Steve, I’m in love, I got to find out what this girl’s name is”…but the fact that I could go on with this story and tell you that I did find out…and that we broke into the house and knocked everybody down, picked her up and ran down the street (crowd cheers) but…but…the real story is we gave up and went home, you see, so we never (chuckles) but anyway, we had a name for her…all the guys on my block called her Flamingo… Clarence…I’ll be walking with her and we’ll be talking…about important things…be like on cloud nine…you know how it is when you just meet somebody…I will…and when she walks, she brightens up my neighbourhood… Audience participation time…(Band: “Sha la la, Pretty Flamingo”)…I’m gonna find her…I will…gonna find her…I’m gonna find her… I’m gonna find her…I’m gonna find her…oh yeah, I will…I’m gonna find her…I know…gonna find her…and when I do…and when I do… and when I do…and when I do…and when I do…Stevie, you know, when I do…I’m probably gonna let her walk right on by…Pretty Flamingo..."